The new property owner of the historic Los Angeles Times building unveiled details Friday about its plans to dramatically transform the downtown Civic Center with high-rise residential towers and a host of stores. Onni Group, a developer in Vancouver, Canada, bought the 202 W. First St. property formerly known as Times Mirror Square for more than $100 million in September. More details of the planned makeover of the newspaper’s historic home emerged this week after Onni submitted a rezoning and development application to the city. The proposal calls for razing the structures on the western half of the block and replacing them with two apartment towers of 37 and 53 stories containing more than 1,200 apartments, a swimming pool and other luxury amenities, according to Onni. A pedestrian walkway between First and Second streets would separate the new towers from the Art Deco-style Times buildings that were built along Spring Street in the 1930s and 1940s. Those old office buildings occupied by The Times and other tenants would be refurbished and the ground floors converted to restaurants, shops and a grocery. The ground floors of the apartments would also have shops and food service, Onni said. The roaring growth in much of downtown Los Angeles is now seeping into the Civic Center, where a subway station is under construction across the street from The Times on Second Street. Another developer plans to build a 30-story office and condominium tower on top of the station. A parking structure and office buildings on the Times property from the 1970s and earlier along Broadway are set for demolition. That includes the six-story former headquarters of Times Mirror Co. at First and Broadway, which was designed by popular Los Angeles architect William Pereira, who also designed the Transamerica Pyramid in San Francisco. Los Angeles architecture firm AC Martin will design the new buildings, Onni said. It is the same firm behind the Wilshire Grand skyscraper, which will be the tallest building in the West when completed. “Onni is very excited for the opportunity to restore the historic Los Angeles Times building and integrate it into a new mixed-use campus, serving an important part of downtown Los Angeles,” David Evans, vice president of development, said in a statement. 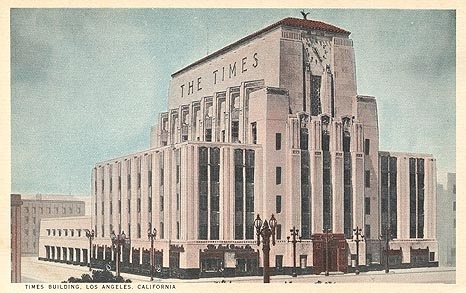 “We also understand the long-standing history the L.A. Times building holds and are dedicated to working carefully with the city to preserve its celebrated aesthetic while ensuring it can continue to stand as a monument to the progress of the city,” Evans said. Downtown development consultant Hal Bastian said the Onni redevelopment would breathe new life into the blocks near City Hall and other government buildings, which have remained relatively sleepy despite downtown’s ongoing revival. The area is largely a government hub without available land open for development, Bastian said. Onni did not set a timetable for construction, but such a large-scale development would typically take at least two years to secure permits and get underway. A company representative declined to estimate the potential cost of development but said Onni would reveal renderings and more detailed plans next year. The Canadian company has been on a buying spree in downtown L.A., where it also owns at least nine other properties — including offices, apartments, an extended-stay hotel and, most recently, an Arts District development lot. Among its more ambitious developments is a 49-story residential tower under construction near the corner of 8th and Hill streets and Level DTLA, a 33-story building with fully furnished extended-stay apartments that opened on Olive Street last year. The Times has a lease until 2018, with two consecutive five-year options beyond that, a person familiar with the terms said in June. A spokeswoman for the paper’s owner, Tronc Inc., said there are no immediate plans to move. Onni was founded by Italian immigrant Inno De Cotiis with the company’s name an anagram of his first name. It has helped transform Vancouver from a sleepy town to a dense city with soaring glass towers. Times staff writer Andrew Khouri contributed to this article.